Excellent Condition, ONLY 8,547 Miles! Sunroof, NAV, Heated Leather Seats, 3rd Row Seat, Quad Seats, Turbo, 4x4, ENGINE: 3.5L TWIN-TURBOCHARGED V6, TRANSMISSION: 10-SPEED AUTOMATIC W/SE... Alloy Wheels, Tow Hitch READ MORE! Leather Seats, Third Row Seat, Navigation, Sunroof, Panoramic Roof, 4x4, Quad Bucket Seats, Power Liftgate, Rear Air, Heated Driver Seat, Heated Rear Seat, Cooled Driver Seat, Back-Up Camera, Running Boards, Premium Sound System Rear Spoiler, MP3 Player, Rear Seat Audio Controls, Remote Trunk Release, Privacy Glass. ENGINE: 3.5L TWIN-TURBOCHARGED V6 (STD), TRANSMISSION: 10-SPEED AUTOMATIC W/SELECTSHIFT paddle activation (STD). 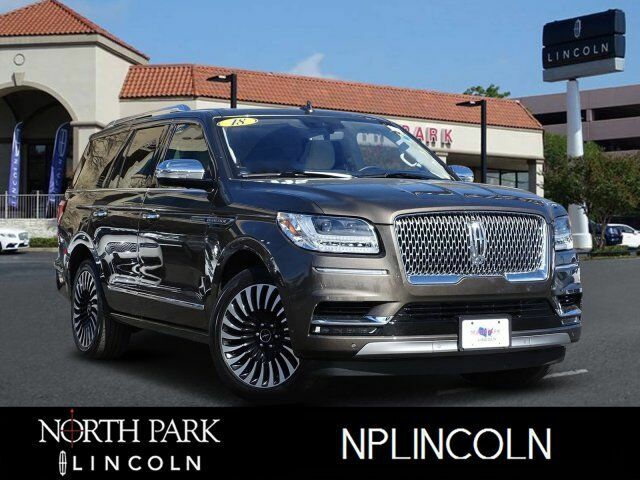 2018 Lincoln Navigator with Chroma Molten Gold exterior and Alpine interior features a V6 Cylinder Engine with 450 HP at 5500 RPM*. Non-Smoker vehicle.